Ask yourself, what would happen in the event of a catastrophic peril hitting your practice? A major fire, flood or impact could close your business for a significant period of time affecting your ability to see clients. The same clients which may have taken years to nurture, who now find their only option is to seek an alternative practitioner. How readily available is alternative equipment? Have you a list of your customers and members of staff stored away from the premises? Do you back up client information off-site? Do you have a trusted right-hand individual who could assist with the clean-up operation while you continue as best as possible to see your customers? All of the above are questions you should be asking yourself as part of your business continuity plan to prepare for any disastrous event. Business continuity planning is the process of identifying where you are vulnerable to these threats and creating a plan to recover the practice should such an interruption occur. (BCP) should be developed to alleviate some of the stress associated with such an occurrence. This is not a daunting task and we have a template for you to download and begin your planning now. 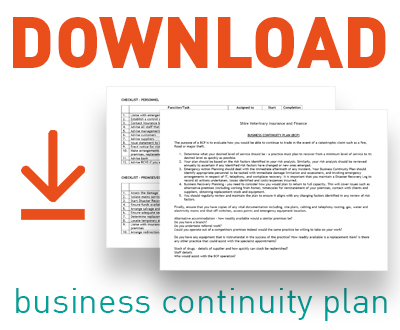 How do I use this sample business continuity plan? The purpose of our BCP template is to help you begin the continuity planning process. There are questions you need to answer which serve as a starting point – each section should prompt you to think about the vulnerable aspects of your business and how you can best protect these or recover from disaster. If you have any queries or concerns please feel free to call us on 01827 306532 or email us on info@shirevet.co.uk to discuss your business continuity plan.